After several administrations of our standardized, grade wide, computerized reading test, our literacy specialist, the “Reading Radical”, noticed a large majority of kids were missing several of the same vocabulary words. One of those words was “quilt”. 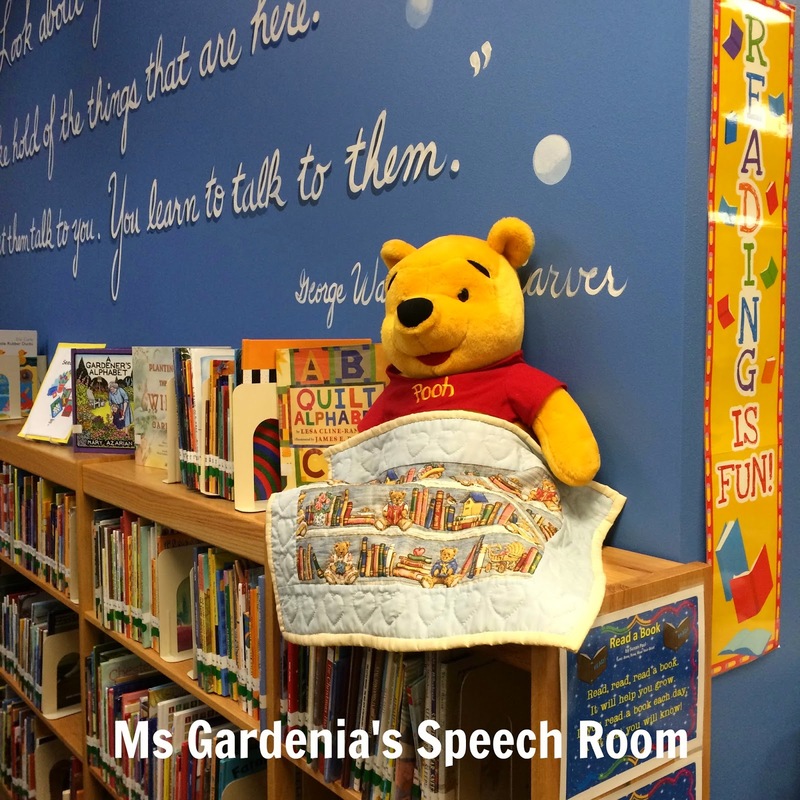 She rallied us together to teach the 4 and 5 year olds on our campus this word through several different modalities. In the mornings, our “Persistent Principal” and “Canny Counselor” stand at the front of the school to welcome all of the children as they come in. Since it is an excellent opportunity to meet ALL of the kids and model social skills, I have worked my way in over the course of the year. Next, we added a sign to the quilt. As the kids came in to school that morning, they would stop and sound out the word or point to the first letter and tell the sound it made. It helped them see it in print and further cement the word into their lexicon. The next morning we added a sheet and an afghan to the array and compared their textures, their patterns, their weight and size. We heard some BEAUTIFUL vocabulary words that morning such as “thin/thick, warm, top/bottom”. After a couple of days of reading the word “quilt” we added another element to the mix! While our principal was holding only one quilt, I held two more. When the kids came in that morning, we asked them what I was holding. DO YOU KNOW that some of them said “BLANKETS! or COVERS!?! ?” We had to teach them yet again that I too was holding quilts. We showed them the stitches and patterns all over again….and the lights started to come on….the connections were made….we could see it in their eyes! I believe this was the morning that one of our overly excited and rambunctious four year olds tip-toe-ran by shouting “QUILTS! QUILTS! QUILTS!” while pumping his fist in the air. He didn’t have time for our questioning phase that morning! One more thing to add an element of surprise to the activity, I REMOVED the quilts and just left the rack with the sign. 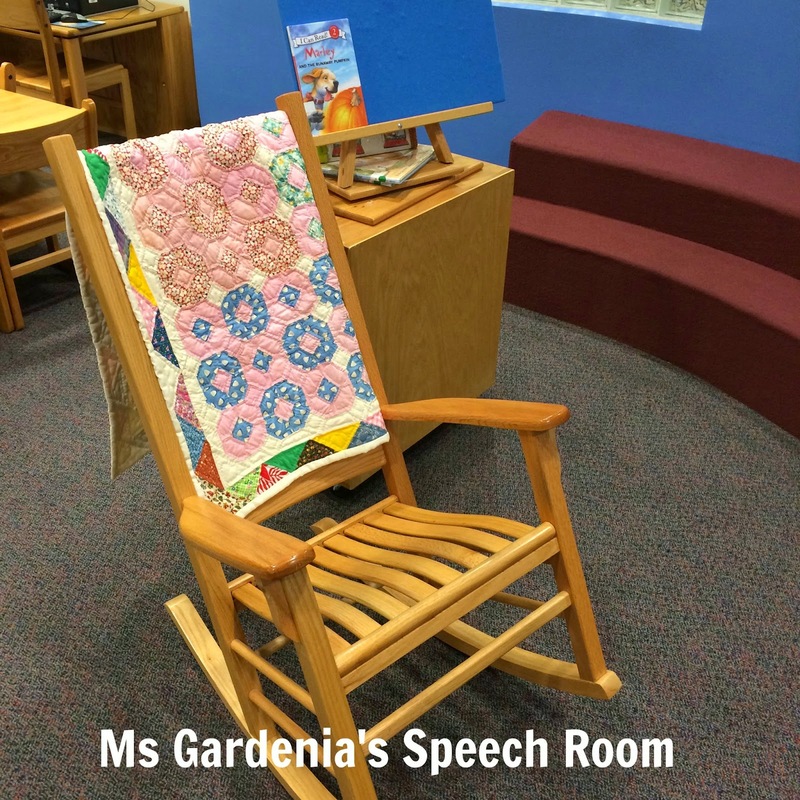 As the kids came in, I asked them “What happened?” and they would amazingly ASK “WHERE are the quilts?” It was fabulous! Success! They now KNEW the term QUILT. It was about that time in the week that the giant TOAD showed up at the playground door of the school so we moved on to that word…(will have a later post about that!) 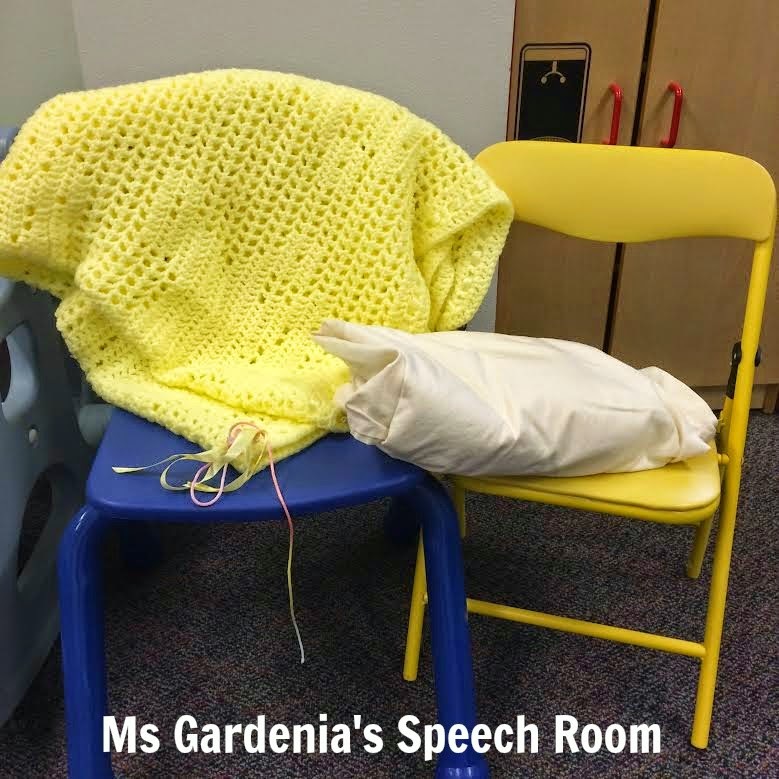 It’s ALL on Instagram @MsGardeniasSpeechRoom . 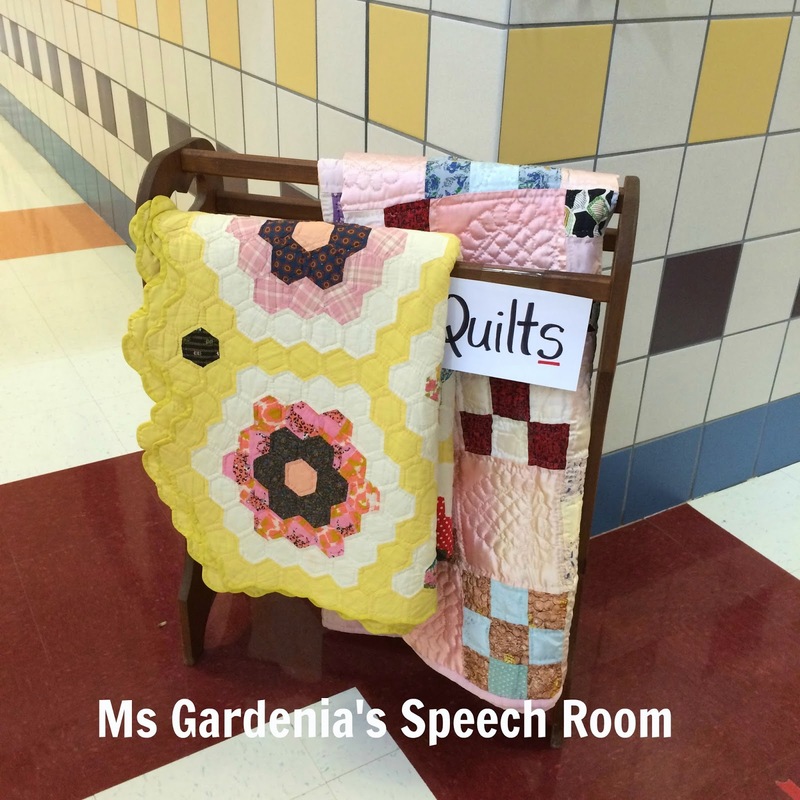 So this week, we have continued our QUILT activities by using the term in the classrooms. Our librarian brought beautifully hand crafted quilts from her mother to place around the library. I wrapped the kids in my quilts as we read and spread them out on the ground afterward. We followed their patterns with our fingers and talked about the shapes and colors. They not only now know “quilt” but they know “stitches, patterns, border, and sew”. Click here to see how we taught vocabulary at RECESS! 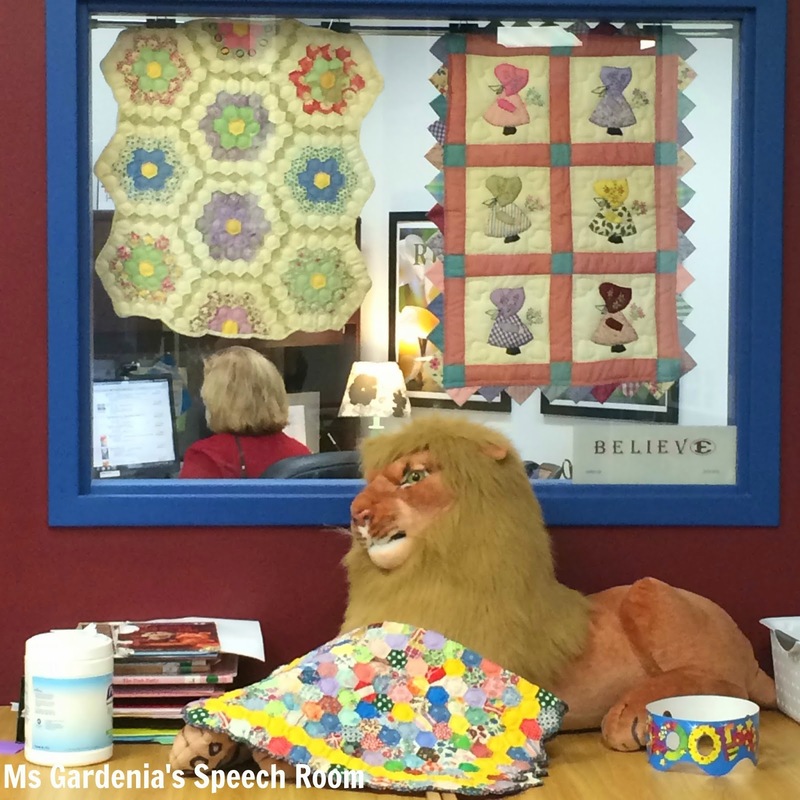 Mrs. Gardner, What a wonderful job you are doing! Your blog is fantastic. And the learning that students do with you is exciting to hear about. Thank you for making learning fun and meaningful!